Culvert de-icing in the most northern climates is a usual rite of spring. Over the winter months snow melt freezes in culverts night after night until the entire culvert is filled with ice. This ice then takes a lot longer to melt in the spring than snow. Rains add to the volume of water unable to drain through the culvert. This creates a situation where water running over roads can cause damage. A regular hot water pressure washer rigged for winter operation is equipped with a special pipe set up. At the gun end of the high-pressure hose, attach a quick connect equipped ball valve. On the hose side install a 3/8″ standard coupler, and on the lance side have a 15-foot length of hose treaded directly into the valve. The lance end of the hose should be reduced to ¼” and fitted with a European style coupler. Four lengths of pipe should have one heavy-duty steel pipe threaded coupler installed. One of the lengths should have a fixed sewer nozzle on one end; this will be the starter pipe. The fifth pipe, which will be closest to the ball valve, should have a European twist fast plug on it that connects with the ball valve coupler. Have a few vise grip type pliers to attach the needed pipes together. Actually threading the pipes together seems like a lot of effort until the first time you lose pipe in a culvert because a quick connect failed. The other problem with quick connects in the culvert is that their outer diameter catches on the ice and slows down penetration. Using sewer jetting hose works great in smaller pipes, but in a culvert it losses direction and ends up stuck at the culvert outer wall. Having several short sections of pipe is helpful if you work in an area where you can’t lay enough pipe to go all the way through the culvert. Add a section at a time where there is limited space to work. If there aren’t any obstructions it is best to assemble the entire pipe needed to deice the entire culvert prior to starting. 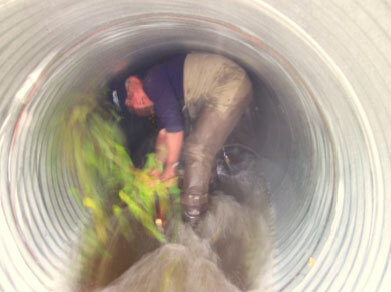 The downstream side of the culvert is where you want to work. The upstream side is generally submerged under ice and water. One or two small holes are normally all you need to free the culvert of ice. Bore the first hole near the bottom of the culvert and the second hole around the center. As long as there is water flowing through the culvert, and there is enough upstream to continue to flow, that water will clear the rest of the ice.